My family can’t get enough of peaches and blueberries this year. The peaches are so good! We had a family picnic earlier this month (yes, I’m just getting around to blogging about it) and I made this delicious trifle. I wanted something that was easy to transport since we had to drive from PA to NJ to the picnic. There’s no cooking involved and after you cut the fruit and cake, it comes together quickly. It was a big hit! There was only a small bowl left after everyone had enjoyed dessert. I’ll definitely be making it again and switch out types of fruit depending on what is in season. I’m thinking it would be delicious with cinnamon baked apples. In a small saucepan, add the lemon juice, 1/4 cup sugar and 1/4 cup water and heat over medium-high heat. Stir until the sugar dissolves and then remove from heat. Add in the vanilla extract and allow to cool. Cut the cake into 1 inch slices and generously brush each side of the cake with the simple syrup mixture. Cut each cake slice into 1 inch cubes. In a bowl of a stand mixer, beat the cream cheese and 2/3 cup of sugar on medium speed until it is smooth. Slowly add in the heavy cream and beat on medium-high speed until the mixture is smooth. It should be the consistency of whipped cream. To assemble the trifle, place 1/3 of the cake cubes on the bottom of the dish. Add a layer of blueberries, about a cup and top with a 1/3 of the cream. Spread the cream out evenly to the edges of the bowl. Top with 1/3 of the peaches and then add another layer of cake cubes. If you had leftover simple syrup, drizzle half of it over the cake cubes. Repeat the process. Add a layer of blueberries, a layer of cream, layer of peaches and then top with the remaining cake cubes. Drizzle the remaining simple syrup over this layer. Finally top the cake with the last of the cream and the berries and peaches on top. Cover and place in the refrigerator for at least 1 hour. This will allow the cream time to thicken. 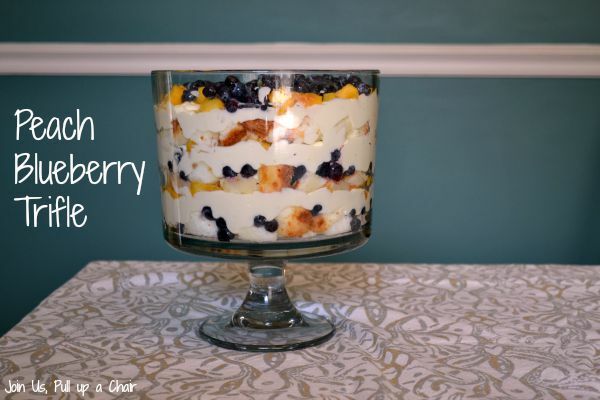 When you’re ready to serve, scoop out the trifle with a spoon into small (or large) dishes. Enjoy! This tart is pretty easy to make and can be prepped ahead of time. I make the crust in the morning and the cheesecake filling and then prepared it right before we were ready for dessert. Well…that was after I had to make a second crust. I had the first crust – it was gorgeous, perfect golden brown – cooling on the kitchen counter. My husband moved it to the dining room table so I had room to finish my prep for dinner and our puppy thought it would be a good afternoon snack. OMG…I almost died when I saw that she had eaten most of it and there were puffed pastry crumbs all over room. So needless to say, luckily I had a second sheet of puffed pastry in the freezer that I thawed while we were eating dinner to make and cool while we cleaned up. Our puppy was fine and I’m sure it won’t be the last time she swipes something else off the table. The final result turned out great! 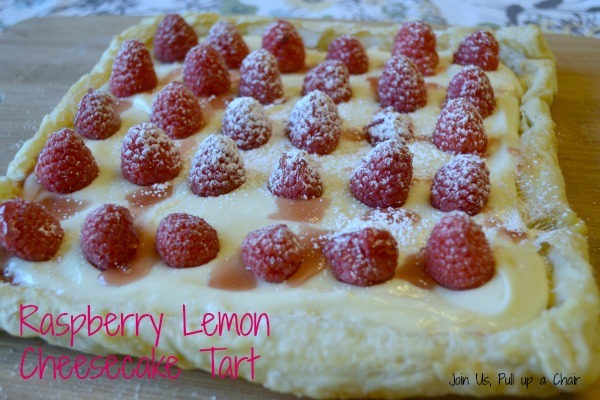 The fresh raspberries, the lemon cheesecake filling and the crisp crust. YUM! If you’re not a fan of raspberries, you could easily substitute them with blueberries or strawberries or even combine all three berries! Preheat oven to 425 degrees. Line a baking sheet with parchment paper and set aside. Lightly flour your counter and unfold the thawed out puff pastry sheet. Gently roll the pastry into a 10×11 inch rectangle and transfer to the prepared baking sheet. Brush a little water on the edges and fold the edges to create a crust. Poke holes all over the center of the tart with a fork. Whip the egg with a little water to create an egg wash and brush the entire crust and then sprinkle 2 teaspoons of sugar over the center. Bake for 15 to 20 minutes or until the crust is golden brown. The center will have puffed up, press it down with the back of a spoon. Transfer to a wire rack to completely cool. While the crust is cooling, you can make the filling. It can be prepared ahead of time and refrigerated until you’re ready to build the tart. In the medium bowl, beat the cream cheese and sugar with a hand-mixture until the mixture is creamy and smooth. Add in the heavy cream and mix for another. Fold in the lemon curd. When you’re ready to assemble the tart, carefully spread the lemon cheesecake mixture over the crust. Arrange the raspberries over the cheesecake mixture. Warm the raspberry jam slightly and drizzle over the top of the tart. Lightly dust the top of the crust with powdered sugar and serve. It’s time for The Secret Recipe Club reveal for my group this month. I had a hard time picking a recipe from my assignment, The Painted Apron, this month. 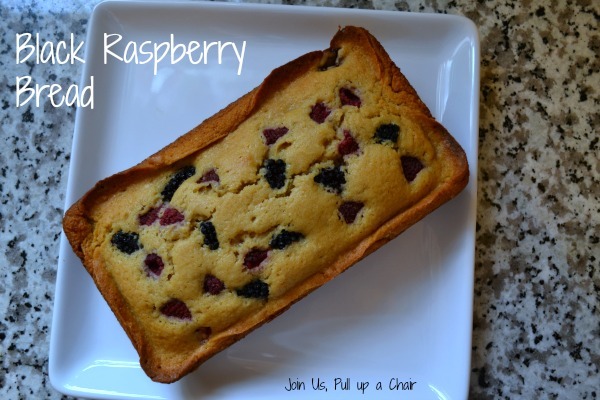 I had several recipes narrowed down, but after picking up raspberries on my last Costco trip, I knew I had to make Jenna recipe for blue raspberry bread….except I switched out the blueberries for black berries and omitted the orange glaze. The bread is really good and made for a perfect breakfast with a cup of coffee or an after dinner snack. My little guy gobbled up a slice and asked for more…success! Preheat oven to 325 degrees and grease a loaf pan, set aside. In a large bowl, mix together all the ingredients except for the berries. Pour half of that batter into the prepared loaf pan. Spread half the berries and then carefully spread the remaining batter on top. Lightly press down the remaining berries into the top of the cake. Bake for 55-60 minutes until the cake is golden brown and a toothpick. Place on a wire rack to cool and then remove and slice. 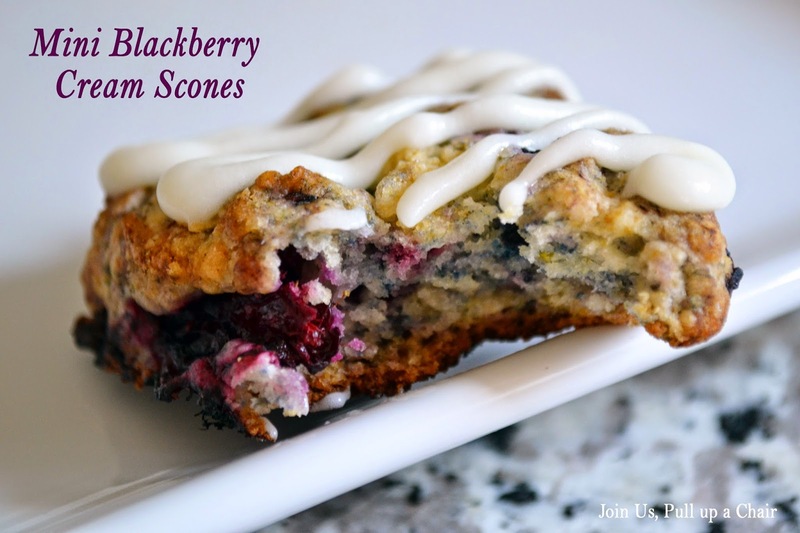 For more great recipes from this week’s SRC bloggers, use the button below! Madeline asked me to make muffins the other day and after giving her different options, she said she wanted blueberry ones with cranberries. Ok..that would be too difficult to do since I had both types of fruit and it was the perfect opportunity to try out a new muffin recipe using cooked quinoa! I’ve been wanting to use quinoa in baked goods for a while and this recipe was a success! Madeline loves them, they’re super moist and packed full of protein – she’s actually been skipping her morning snack at school because she’s still full from breakfast. Preheat oven to 400 degrees and line a muffin pan with paper liners, set aside. In a large bowl, mix together the quinoa, flour, sugar, baking powder, and salt. In a separate bowl, combine the milk, yogurt, oil, egg, and vanilla. Pour the wet ingredients into the dry mixture and stir until just combined. Fold in the fruit. Scoop out the batter into the prepared muffin pan until they are 3/4 of the way full. These muffins only rise slightly and are much more dense that regular muffins. Bake for 20 to 25 minutes until golden brown. Remove from the oven and allow to cool 5 minutes in the pan. Remove from pan and place on a wire rack to completely cool. This month is national ice cream month and I knew I had to make ice cream. I love ice cream, but it doesn’t love me back. I know…it’s not fair! I was browsing through the July/August Eating Well Magazine and came across this easy recipe for ice cream pie. It gave a master recipe and then five different flavor combinations. I would recommend making it only a day before you need the pie and not letting it sit in the freezer for an extended amount of time. I found that a couple days after, it started turning icy. Preheat your oven to 350 degrees. Process the graham cracker crumbs in a food processor until they are finely crushed. Add the oil and then process until the oil is combined. Lightly coat a pie pan with nonstick cooking spray and then press down the crumbs with the back of a spoon onto the bottom and sides of a pie pan. Bake for 10 to 12 minutes and then allow to cool completely before adding the filling. Using a handheld mixer, whip the heavy cream until it starts to thicken. Add in the sugar and whip until stiff peaks form. Fold in the yogurt and pureed berries. Pour the mixture into the cooled crust and then cover with a piece of plastic wrap. Place in the freezer for at least 5 hours. Allow the pie to sit at room temperature for 15 minutes until it has slightly softened before slicing. Scones come in a close second to muffins for me. 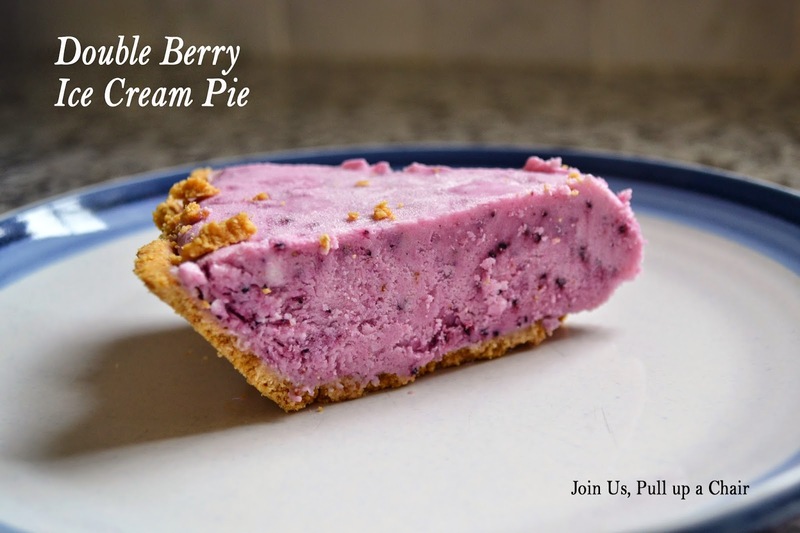 There’s something about the cream, butter, and texture that I can’t pass up….now add in fresh blackberries and a little lemon. Mouthwatering, right? 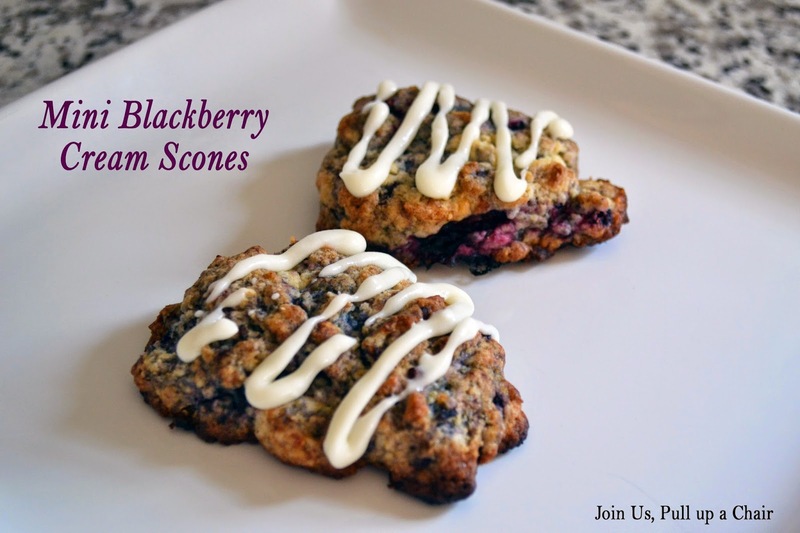 These scones are perfect to enjoy with your cup of coffee or tea for breakfast or for a little afternoon snack. I whipped up this recipe in less than 10 minutes and my kids got a kick out of how messy I got while mixing the batter with my hands. Preheat your oven to 425 degrees. Line a baking sheet with parchment paper and set aside. In a large bowl, combine the flour, baking powder, salt and sugar. Using a pastry knife, cut in the butter until the mixture resembles coarse crumbs. Add in the blackberries and lemon zest. Pour in the cream and then mix with your hands until a dough forms. Once fully mixed together, place the dough on the prepared baking sheet and form into a small circle. Cut the dough into 8 wedges, I start by cutting the dough in half and then each half gets cut in half again and then each quarter in half. Separate the wedges and bake for 12-15 minutes, until the scones are golden brown. Once the scones have cooled, make a glaze. Mix together 1/4 cup powdered sugar and 2 tsp of heavy whipping cream. Drizzle over the top of each scone and enjoy! It’s the second Monday of the month and you know what that means….it’s SECRET RECIPE CLUB time!! I’ve participated in the group for more than 2 years and I love it. It’s a great way to meet new bloggers and try new recipes – it has taken me outside of my comfort zone with my cooking and baking and I’ve made a bunch of new friends this way too! This month my assignment was This Mama Cooks. Anne-Marie’s blog focuses on healthy recipes and lifestyle tips for busy moms and their families – perfect for me since I’m a busy mom and always trying to find new way to eat healthier and incorporate more veggies into our diet. There’s a bunch of gluten-free and milk-free recipes too. The only allergy I have to worry about is crab since my husband is very allergic to it and we haven’t introduced it to our kids because of the severity of his allergy. I definitely want to try a few of the milk-free recipes…I love the use of tofu in many of her recipes. 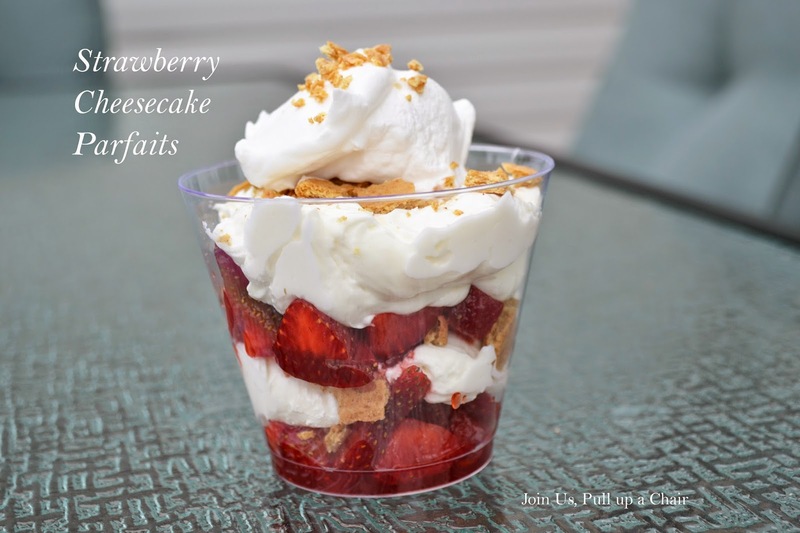 After going through all the recipes on the site, I decided on strawberry cheesecake parfaits. The recipe was super simple and perfect timing since strawberries are starting to be in season in PA. It made a great dessert and topped off a fun weekend of family time. Plus Madeline was able to help me assemble them! In a small bowl, combine the sliced strawberries and tablespoon of sugar. In a medium bowl, beat together the cream cheese, yogurt, confectioners sugar and almond extract. Fold in 1/2 cup of the whipped topping. To assemble the parfaits, place a layer of strawberries at the bottom of the dish, next layer some of the cream cheese filling and top with graham cracker crumbs. Continue layering until you reach the top of the dish. Place a dollop of whipped topping on to finish your parfait. Things have been a little quiet around here lately….my little guy was dealing with a random fever for over a week. So needless to say, I had very little time to do any cooking or baking since he was attached to me. He’s doing better now and we’re not sure what caused the fever, just some random virus. It’s been quite frustrating, he would be fine for most of the day and then after his nap, his temperature would spike to 103 or high….so scary! I did manage to bake up a batch of these breakfast bars. Madeline was off swimming with some of her friends from the neighborhood and I figured they could use a snack after being outside most of the day. These were quick and easy to make. The girls gobbled them up and of course Madeline wanted seconds! 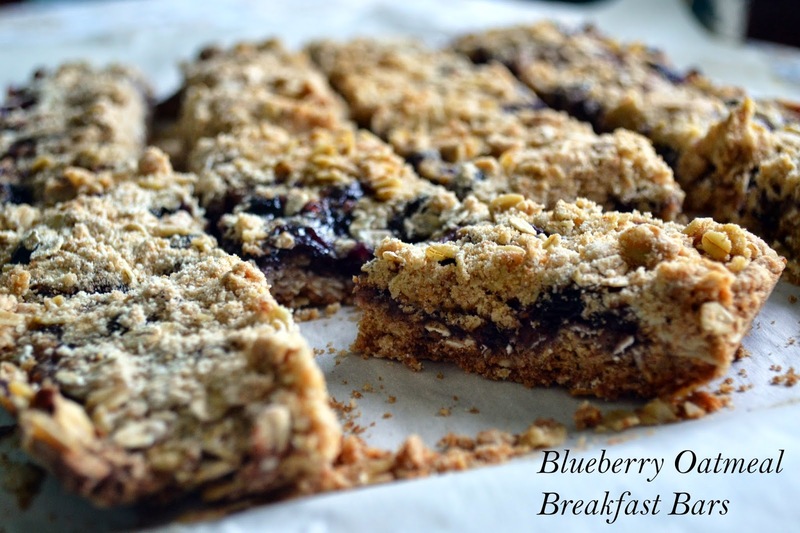 I love that they featured whole wheat flour and oats plus fresh blueberries! They would be great for breakfast but I loved that they were great for an after school snack! Line a 9×13 baking pan with parchment paper and set aside. Preheat oven to 350 degrees. In a large bowl, combine the flours, brown sugar, oats, baking powder, salt and baking soda. Mix until well combined. Cut in the cubed butter until coarse crumbs form with the dry mixture and butter. Remove 1 1/2 cups to another bowl and set aside. In the remaining mixture, combine the egg white until mixture is wet. Gently fold in the blueberries. Evenly pat this mixture into the bottom of the prepared pan. Bake for 10 minutes until the crust has set. Spread the jarred blueberry preserves over the baked crust. Sprinkle the reserved flour/butter mixture over the preserves. Bake for an additional 30 to 35 minutes or until the topping is golden brown. Remove from oven and allow to cool in the pan for 10 minutes. Lift out the bars using the parchment paper and place on a wire cooling rack. Cool completely and then slice into the desired sized bars. As you know, I love making muffins for the kids! 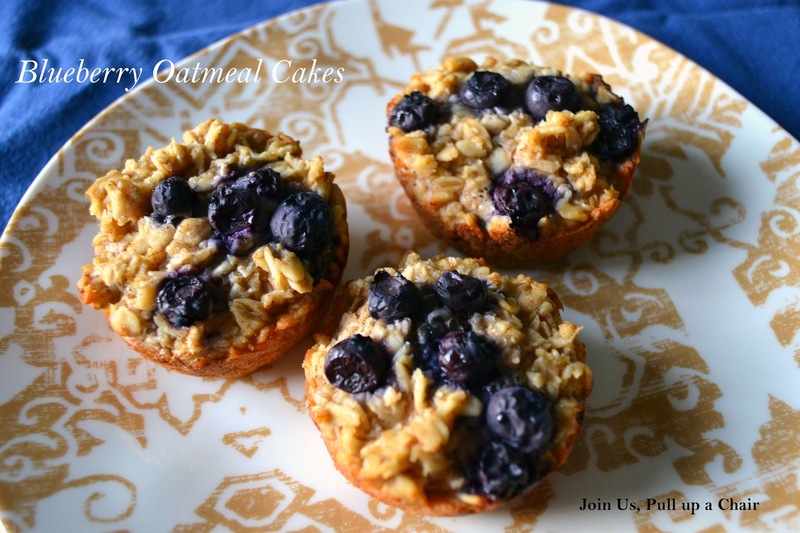 These oatmeal cakes were the perfect snack or even for breakfast. I made half with blueberries and the other half with strawberries. 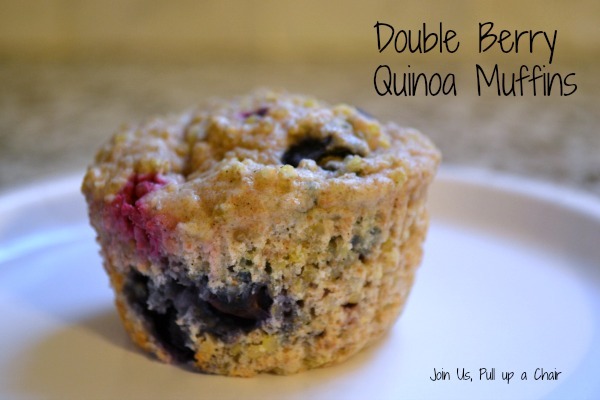 They’re the perfect combination of oatmeal and a muffin, plus I feel better that my kids are getting homemade snacks instead of snacks that are processed with a bunch of ingredients that I can’t pronounce! So I’ve been thinking about adding some more lifestyle posts to my blog. I’ve tried Stitch Fix and thought about doing a review and have been refinishing a piece of furniture, but I want to make sure you guys would like to see those things. I’ll mainly focus on food, but I think it would be fun to do some new types of posts and you’ll get to learn a little more about me, my life and what else I do beside cooking and baking. What do you say? Combine the oats and skim milk in a bowl and stir. Allow to sit overnight in the refrigerator until the majority of the milk has been absorbed (up to 12 hours). Preheat oven to 375 degrees and spray a muffin pan with non-stick cooking spray. Set aside. In the soaked oats, add in the egg, maple syrup, oil, vanilla, cinnamon, baking powder and salt. Stir until the mixture is well combined. Divide the batter between the 12 muffin cups. Sprinkle the top of of each cake with 1/4 cup of blueberries. Bake for 25 to 30 minutes until the cakes spring back when they’re touched and have turned light brown. Remove from the oven and allow to cool in the pan for 10 minutes. Serve warm. If you have oatmeal cakes left, store them in an airtight container in the refrigerator.